Thankfully, we’ve been so very blessed by the support we received from our family and friends since Ella’s passing. In June 2017, after fundraising, we were able to open a Butterfly Bereavement Room at Texas Children’s Pavilion for Women in their neonatal intensive care unit (NICU) in Ella’s memory. We also had enough funds remaining to purchase two Caring Cradles to be donated in Ella’s memory. 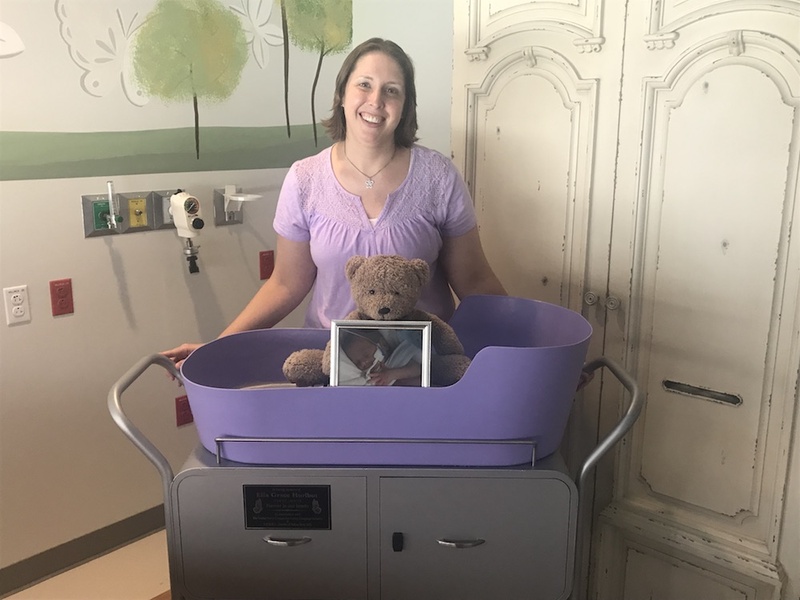 Our first cradle was donated on July 20, 2018, to the Women’s Specialty Unit at Texas Children’s Pavilion for Women to be used by families going through stillbirth. Our second cradle was donated on Aug. 7, 2018, to the NICU at Texas Children’s Hospital The Woodlands. The Caring Cradle cools the baby’s body after passing, giving families more precious time with their baby in the process. This prevents any distressing physical changes from happening to the baby’s body. In addition, the Caring Cradle gives families an opportunity to keep their baby in the room with them, providing a more dignified experience as they say goodbye. After we lost Ella, feeling her body change was one of the most upsetting things for me. Those changes made me realize how quickly she was slipping away from me. As a grieving mother, I struggled knowing I only had a short amount of time to create memories with her. It’s our prayer for these Caring Cradles to give the gift of time to grieving families; time to bathe their baby, sing to them, read to them and take pictures with them. Once you leave the hospital, those memories are what you cling to in the months and years after your loss. We pray these cradles bring peace and comfort to other families going through the same painful experience of losing a baby. We also hope they will offer perspective into what grieving families go through after a loss. In the end, we’re very thankful for the opportunity to turn something so tragic into something good. Ella’s life will continue to impact grieving families in a positive way for many years to come.